ZW3D has super fast geometry translators for importing nearly any type of file, including STL and image files (jpg, bmp, tif). Poor geometry will not stop ZW3D because of our support open shape modeling. Import and Export 3D geometry fast and eliminate model repair time. • IGES: ZW3D supports the latest IGES standards and works seamlessly with non-solids. • STEP: Import AP 203 and 214 and export AP 203. STEP assembly/layer support. • Parasolid: ZW3D supports the latest parasolid libraries and properly exports ZW3D Assemblies to parasolid assemblies or bodies. • STL: STL files can be imported, modified and exported. 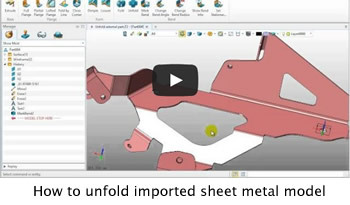 Use the advanced design and CAM tools to surfaced or machined STL. • Uses the latest DWG direct™ library from open DWG Alliance. • Handles Unicode (double byte characters) which is primarily found in Asian DWG translations. • Accurate layer, colour, hatching and ACAD Font support. 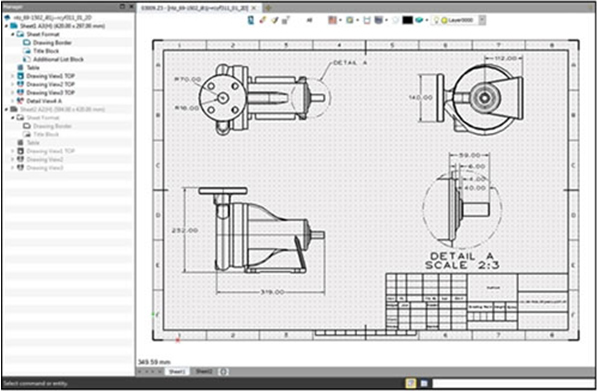 • Users can specify the units of measure to import a DWG file. • Directly Copy and Paste Entities from ZWCAD to ZW3D. • Import 2D Images (jpg, tif, bmp) into sketches. • Accurate raster to vector conversion with a minimum entities. • Convert curves to lines and arcs with complete continuity control. ZW3D features a next generation 3D SmoothFlow design paradigm. SmoothFlow will make ZW3D the fastest, most effective 3D CAD system available anywhere. It combines the speed and flexibility of direct modeling with the precise control of dimension-driven designs, without losing the features and functionality of history-based modeling. 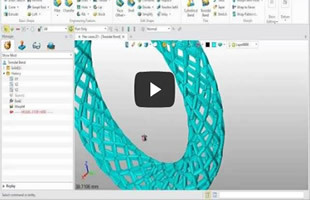 You can modify features quickly and effectively on native or imported geometry without history regeneration. ZW3D allows designer to create different 2D sheet in one layout. The non-activated sheet is dimmed. Multiple file tab greatly enhances the operational flexibility. Designer can easily transfer between files. Creating a new file or adding a new object into the current file becomes more convenient. Sketching is easy in ZW3D especially with tools such as Quick Draw and Ready-sketch. These automation tools allow users to create fully-constrained sketches with a single command. 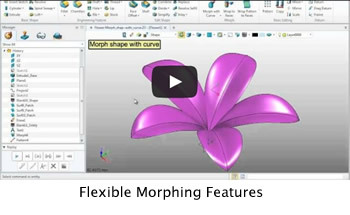 ZW3D users have the power to work with fully-constrained, partially-constrained or unconstrained geometry. Freedom by design. • "Ready Sketch Text" will not be converted to regular curves after its creation and can be redefined, like changing its characters, font or size. • Easier Curve Creation, Edit and Quality Inquiry. • A handle is provided on the pick point where a click happens on a CV curve, to help to drag to change the tangency, tangency magnitude and radius, or position. • "Power Trim" command offers a very easy and intuitive way to trim or delete entities. • To multiply an entity, "Copy" is a way to do. Now there is another new way - "Pattern". A 3D sketch can be used as a sweep path, or a drive curve of a loft feature. It's widely applied in piping system. Designers can draw a 3D sketch in an independent environment. Apart from auto constraints, you can also add dimensions and constraints as needed. ZW3D supports true parametric (dimension driven) feature-based modeling, in addition to a range of direct editing commands not found in traditional feature-based modelers. For instance, parts can be moved into machine or mold position without effort, quickly offset any face with a right-mouse click, change draft angles and add fillets, remove holes, or completely reshape the part with morphing. 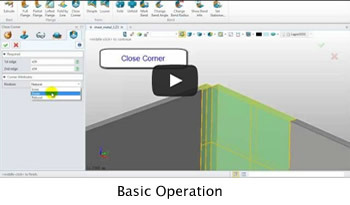 These edits can be made to open or closed shape, points, wireframe, STL or solid/surface models. ZW3D also provides tools for removing features on native or imported geometry using the simplify or erase and fill gaps commands. Mold and Die designers can split imported geometry without having to spend hours healing parts. ZW3D also has support for reducing the time to regenerate History with the History Backup and Encapsulate commands. The recent introduction of subparts expands on this idea. ZW3D gives the user quick and simple tools to let them work with native and imported geometry. Learn ZW3D at your own pace on your own schedule. Get up and running fast with Show-n-Tell 3D tutorials, that work like a 3D book. The Show-n-Tell™ Tutorials system is built into all of the ZW3D products, providing on screen step-by-step lessons on a wide range of topics. 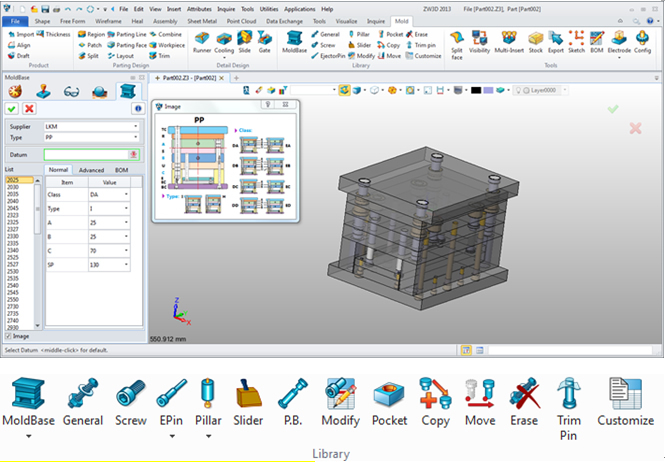 Show-n-tell is also has a complete set of authoring tools and is used for design review assembly instructions. Whether laying out 3D models or using traditional drawing techniques, ZW3D makes it simple to create production drawings and details. Creating views of 3D models and assemblies is easy especially since all views update automatically to reflect model or assembly changes. ZW3D burst technology offers efficient handling of 10,000 part assemblies or larger. By special handling of display data, ZW3D minimizes memory usage which allows users to efficiently manipulate and manage assemblies from design prototyping through manufacturing. 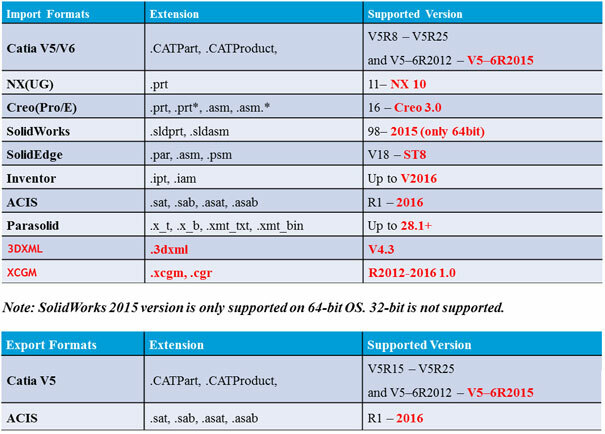 • Assembly history regeneration offer more and better edit behaviour. PMI (Product Manufacturing Information) is 3D annotation,which allows designers intuitively create dimension and annotation on the 3D entities. ZW3D healing with new healing function can analyze and quickly repair abnormal conditions found in the geometry of imported files (e.g., vertex points, edge curves, UV curves, and face boundaries). These abnormalities include gaps that are impossible to machine. ZW3D can resolve thousands of such problems in minutes. Even though ZW3D can go straight to work on poor geometry, great healing tools are still essential to anyone that works with imported data. 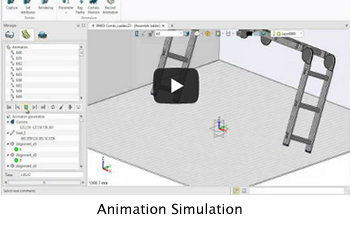 With animation tools, designers can demonstrate the design's basic operation as they would with a real life product. This can be saved as a *.AVI video. • Easy to define the alternate parts and configurations. • Compare two parts and show the differences between them. • Use vivid animation to demonstrate the product to anyone, including assembly or disassembly process, product movement. 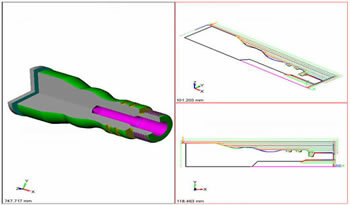 Flex tools are useful for deformation design. With intuitive tools, designer can quickly modify complex models for many different applications including concept design, product design, industrial design, and so on. Features include Cylindrical bend, Toroidal bend, Twist, Taper and Stretch. Solid shape and surface both are supported. 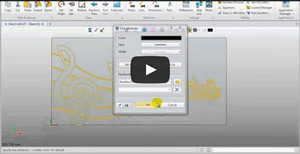 Users can continuously work on a model while displaying either a zebra stripe or draft analysis thus providing instantaneous, real-time feedback without interruptions or slow-downs. 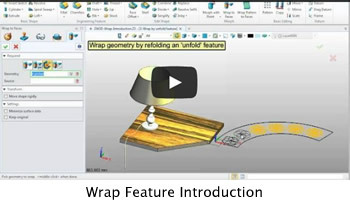 ZW3D hybrid modeling lets users model instantaneously with solid, surface or wire-frame geometry in real-time checking mode which significantly reduces interruptions to their session or system degradation. For example, an industrial designer can simply turn on zebra striping to check curvature while modeling a product and then instantly switch over to draft checking to see if there are any draft problems. ZW3D has an assembly level display tool that lets users toggle the display mode of any component. So, if a user wants to see inside a gear box or through a mold plate, instead of hiding parts, all he has to do is right-click a part and render it as transparent or wireframe. ZW3D gives the user even more control by allowing multiple instances of the same part to be displayed differently. The use of these display tools results in time saved designing and communicating ideas. Dynamic Slicing in ZW3D goes beyond the norm as simply a "cool visualization tool." 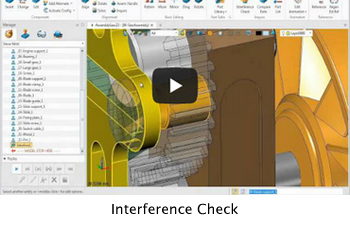 One of the key features of dynamic slicing is the real-time interference check. Users can see all interferences as the slice plane is moved across the assembly. This functionality gives instant interference feedback and virtually eliminates the need to process a separate interference check. Users can continue to model while in a sliced display mode and can save sliced views to be recalled later. 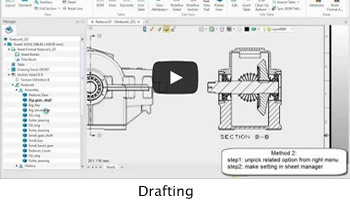 Hours of design time can be saved with ZW3D's Design Optimizer. Design Optimizer is an equation solver that is useful for driving specified design parameters to solve an engineering problem. For example, an engineer can control which parameters of a design can be changed to optimize a model to a lowest mass condition or drive a design to a specific volume. 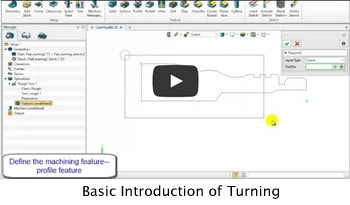 Design parameters can be held within a range and can also manually tweaked to get instant feedback. • FEA(SimWise):ZW3D links directly with SimWise exporting an optimized data set for analysis. 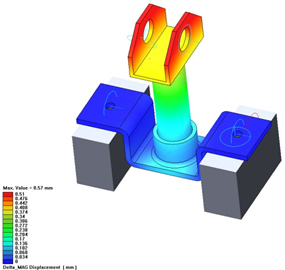 ZW3D supports the STL requirements of other third Party analysis products. • PDM: Workgroups need an easy to use solution for document control. ZW3D provides tools for file check-in/out, read-write permissions, version and revision control and attribute searching. ZW3D also supports a wide range of third party PDM systems. • CMM: Point files can be imported directly into ZW3D from any coordinate measuring machine or 3D scanner. ZW3D also has direct links to Romer and Microscribe arms for live point creation. ZW3D can automate core cavity creation. 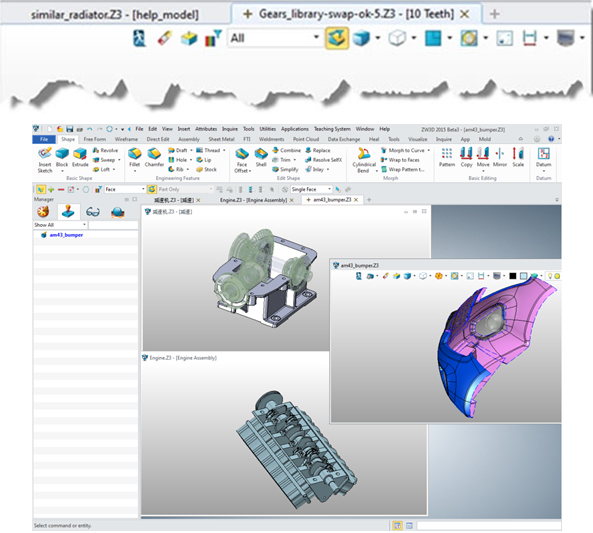 ZW3D includes utilities to automate create core and cavity region, parting lines and faces in mold design, which provide the flexibility for mold designers. 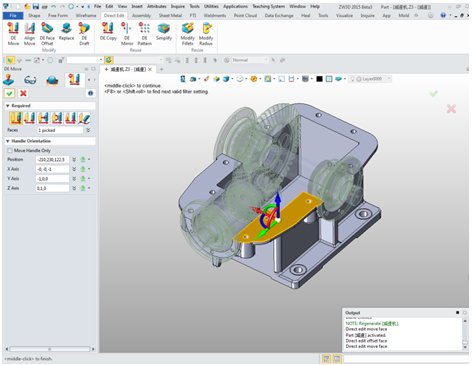 Insert complete mold bases from DME, FUTABA, HASCO, LKM, MEUSBURGER and OXA_RABOURDIN , with all of the purchased components and proper BOM information. Many kinds of standard parts are available, including screw, guide pillar, ejector pin, locating ring and so on. • Effiiently create cooling channel features in core and cavity blocks during mold design. • Easily create channels and plug connector holes. 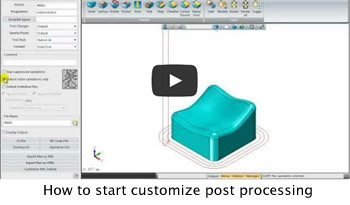 • Quickly create a mold slide/insert feature by extending a profile that lies on a face. • Users can freely modify the parameters according to practical requirement. Many efficient assistant tools are provided to create electrodes. • Freely extract electrodes according to a model's features or face. • Define electrode blank size for multiple electrodes, park gaps and EDM setting information. • Create electrode sparking drawing. The 2-axis milling tactic provides a rich set of tool paths for rough stock removal and surface finishing. It also provides the means for the operator to make holes or cut access holes with drills or mill tools. 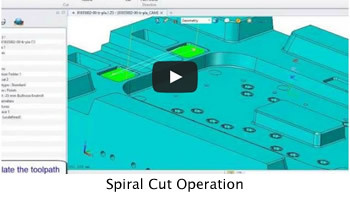 The 2.5-axis tool paths include profiling and pocketing by collapsing step-over (inward or outward), parallel linear cuts, or continuous spiralling. ZW3D 2X turning includes outer diamater and inner diameter roughing, finishing, threading, grooving operations, as well as hole making operation. ZW3D automatically recognizes hole features and selects the proper tooling, spot drill, tap, c'bore or c'sink. ZW3D gives the users total control over parent tools. You can drill, bore, ream or tap points, circles, cylinders, half cylinders(common with imported parts) and native or imported holes. Automatic generation of correct and efficient 3D CNC machining plans requires the identification and association of features such as holes, slots and pockets, with a distinctive manufacturing process. 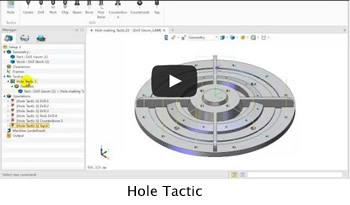 Using ZW3D's combination of tools, automation and shop-floor machining logic, ZW3D breaks down part topology into solid features and then analyzes the capabilities of library tools to produce an effective, efficient machining plan and generate a realistic machining work flow. 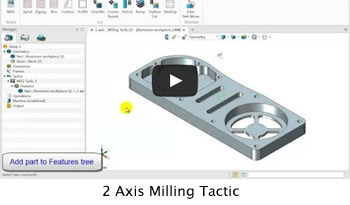 3-axis milling provides several families of tool paths based on different algorithms for positioning the tool. Each has its place in either roughing or finishing parts. Handle your toughest jobs: The ZW3D QuickMill suite offers dramatic speed and tool path improvements for tool and die machining applications-yet has exceptional ease of use to minimize training and support. 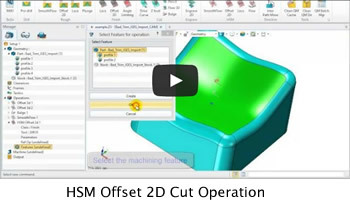 A full range of material handling and cutting techniques are supported to allow extremely complex milling in 3D. 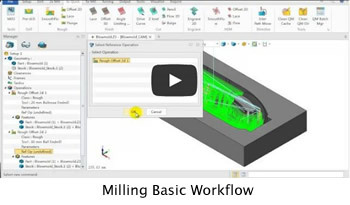 Even difficult steep and shallow mold situations are easily performed in ZW3D QuickMill with advanced limiting, which eliminates milling problems in molds with steep walls or where a part needs to be progressively milled with a variety of tools and holders. Reduce Programming Effort: Intelligent Machining Automation is made possible by the way QuickMill™ takes a unique whole part approach to machining. 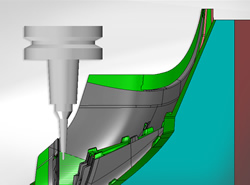 Users establish their own rules for machining a part, which ZW3D can use as a knowledge base for intelligently machining for a vast array of other parts. This greatly reduces the time required for programming new parts. In essence, ZW3D captures and uses the knowledge and logic of an experienced machinist for automatically generating machining. SmoothFlow™ technology mills cavities and pockets safely and efficiently by maintaining constant material removal during roughing thus extending tool life and reducing machine wear and tear. AFC (Adaptive Feedrate Control) automatically adjust federates based on tool loading to ensure a constant chip load. Higher feed rates are possible without the risk of tool breakage by reducing the radial pressure on the tool spindle, essential for optimizing HSM machines. SmoothFlow™ motion is softly contoured with corners and tight areas safely milled without full width cuts which prevents tool and spindle overload. All of these factors are critical for unattended machining to achieve extended tool life and reduced milling time. ZW3D SmoothFlow™ gives programmers the confidence to boost productivity with ideal feed-rates and cutting technology. ZW3D can automatically detect the minimum tool length to eliminate the human errors and increase the work efficiency. The accurate calculation of the minimum tool hang length ensures the safety of your machining. 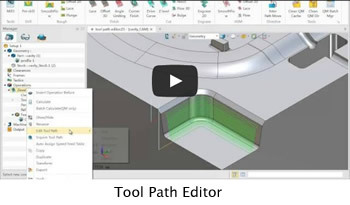 New tool-path editor tools enable users to easily and intuitively edit the entire or partial tool-path for higher machining efficiency. • Update the edited elements without re-calculating the whole tool-path, greatly saving programming time. • Easily trim the partial tool-paths with window pick, chain select and polygon select. • Freely change the sequence and direction of the tool-path with the reorder functions. • Quickly change lead in and lead out types of partial tool-paths in terms of manufacturing request with the re-link tools. Some icons of CAM Manager are modified, which make the operations status more clear. Auto-rename is full-supported in all folders including Component Folder, Feature Folder?Frame Folder, Operation Folder, NC Folder. 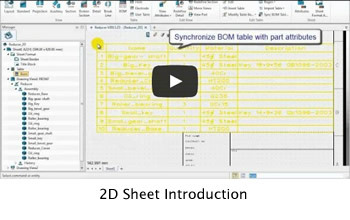 ZW3D provides the ability to associate speed and feed tables with materials, tools and even operation types. The user will be able to set a mode causing ZW3D to automatically assign the speeds and feeds which are the best match for the user's settings when the tool is assigned to each operation. ZW3D Post provides advanced post-processing capability for converting cutter location data (APT-CL) into machine specific code (G and M code) required by CNC machines. ZW3D Post is integrated into all ZW3D machining bundles.